Our big question this week, and perhaps presaging the take-home exam, is how did the new freedoms of the liberalizing world change the 19th-century Atlantic world? be able to compare the place of free and unfree labour in the liberalizing Atlantic World. Read ONE of the two essays below (though read BOTH for the exam!!). What were the economic forces that were changing American society? 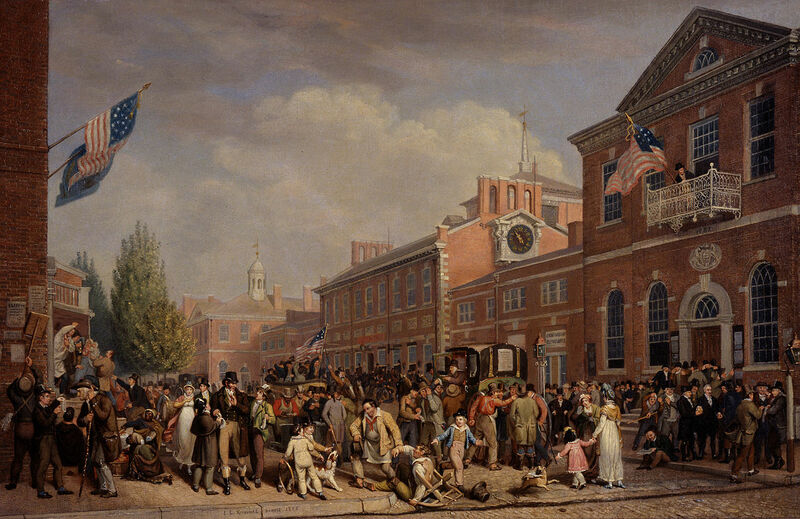 What were the political forces that were changing American society? Does slavery appear to have been sustainable in America at this time? How did British colonial planners imagine the future of post-emancipation Trinidad? In the British planners' vision of the future of Trinidad, would freedom prevail? The history of “Rule Britannia” – which remains Britain’s most popular patriotic song – dates from the 1740s. It was a time when many still recalled the creation of the Bill of Rights in 1689 [resisting internal tyrants], the wars with France, Holland and Germany [resisting external foes], and when Britons were enslaved, captured and often ransomed by the famed Barbary pirates of North Africa [resisting actual enslavement, if not in numbers anywhere close to those that the British took from Africa]. It’s ironic of course because at that time Britain was the largest and wealthiest slave-trading nation in the world. The power of the Royal Navy was in large part supported by seamen who learned their craft plying the coasts of Africa, carried on ships financed by slave capital, and on revenues earned in Caribbean plantations. Britons would “never, never, never be slaves”, but their power and ultimately their freedom would be built on slavery. 100 years later that would be over. In 1833 Britain made slavery illegal. In short, this is a remarkable tale of political and economic transformation. This week, we want to take a quick look at a time when that story seemed to have been ending. We’ll have fewer readings this week. In part, this is because we’re wanting you to concentrate on your essays; but in part it’s also because we’re wanting you to take this opportunity to prepare for your take-home exam. The exact question for that exam will be given out the day after your final essays are due. But you’ll see that the question is closely linked to the readings. There are two readings on the list of secondary sources this week, but we’re only asking you to read one for now (however, for the exam, you should read both). Each essay looks at the period around 1840 as a moment of transition and adaptation. Each essay looks at a changing economy during the industrial revolution, and examines how people thought about wealth, power, liberty, and politics in this moment when democracy was expanding, and slavery was just beginning to end. Slavery, of course, would not die in the United States until the Civil War in (1861-65). But in the British Empire slavery was banned after 1833, and the electoral franchise had been extended to far more people with the Great Reform Act of 1832. Thus, this was a time of change. Yet, these changes were no less contentious, and many people worried about what these changes would mean. Last week, in reading about abolitionism, we saw that one of the anti-abolitionists' arguments was that social chaos would result from abolition: in other words, that the labour market would be flooded with poor black workers, that whites and blacks would mix inappropriately, and that social order would decline. Our essays this week examine some of these moments of change. The first essay examines the schemes British colonial planners had for Trinidad after emancipation. Trinidad was a major slave colony, producing sugar for the global-western market. How, these planners asked, could that continue, in the era of free market labour? The second essay is about America. It is a chapter from John Larsen’s book The Market Revolution. Larsen’s book takes readers through the many “marvelous improvements” of early 19th-century America, the financial panic of 1837, and its social and economic fall-out over the next twenty years. In our chapter, we read of the different impacts the economic and political changes had for farmers, workers, women, and slaves. In all these cases, we see the impact of economic and political change on the lives of ordinary people, and in the imaginations of those who would govern them. There are no primary sources for this week. John L. Larson, "Heartless Markets, Heartless Men," ch. 3 from The Market Revolution: Liberty, Ambition, and the Eclipse of the Common Good (New York: Cambridge University Press, 2010), selections. James Epstein, “Freedom Rules/Colonial Fractures: Bringing ‘Free’ Labor to Trinidad in the Age of Revolution”, in Simon Gunn and James Vernon, eds., The Peculiarities of Liberal Modernity in Imperial Britain (Berkley: University of California Press, 2011), 39-53.